Although Election Day is months away, campaign spending is well under way and outpacing any previous presidential election years, as demonstrated by the Federal Election Commission’s (FEC) statistics from the first 15 months of the 2015-2016 election cycle. In total, presidential, congressional, party committee and political action committee (PAC) filers raised over $4 billion from January 1, 2015, to March 31, 2016. 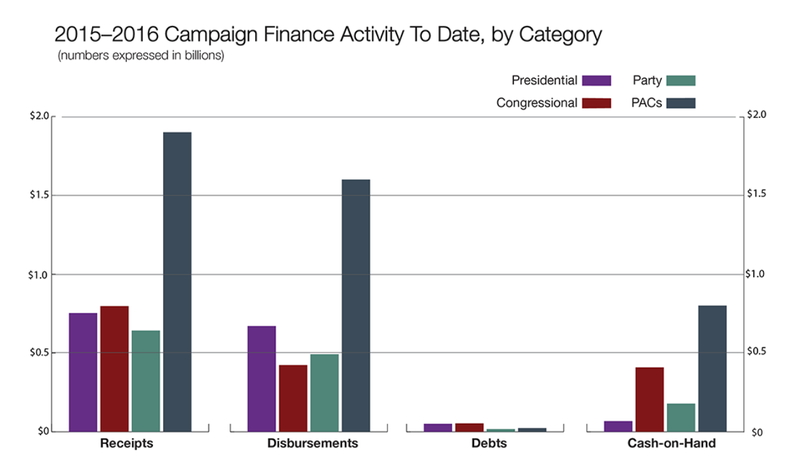 Presidential candidates raised $735.3 million and reported expenditures of $671.1 million during the period. Presidential candidates who filed campaign finance reports also disclosed a combined $50.8 million in debts and $67.8 million in cash on hand as of March 31, 2016. Not surprisingly, spending and overall activity this cycle is higher than in the previous election cycles, but lags behind 2008, which was the last recent election without an incumbent president running. The number of declared candidates is also up this season, according to the FEC: 93 presidential candidates filed for this election, which is double the number of candidates from the last three presidential elections combined. PAC activity is also up. Throughout the months covered by the report, 7,774 federal PACs filed with the FEC, reporting $1.9 billion raised and $16 billion spent. 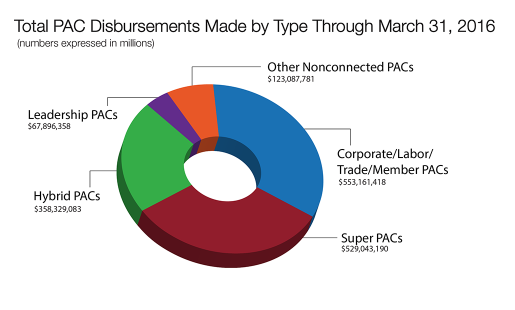 The most significant portion of these funds were raised by independent expenditure-only PACs (nonconnected PACs), which make up 2,320 of the total filers and nearly $700 million of the receipts. Funds raised by corporate PACs (separate segregated funds), which make up 1,736 of the total filers, totaled approximately $250 million. Although committees with noncontribution accounts and the labor group represent small portions of the registered PACs (1.9 and 3.6 percent, respectively), they together raised $572 million or an estimated 30 percent of the total funds for this type of political group. Independent expenditures, which are used for communications that are not at the request of or endorsed by a candidate, made up $310 million of additional receipts. 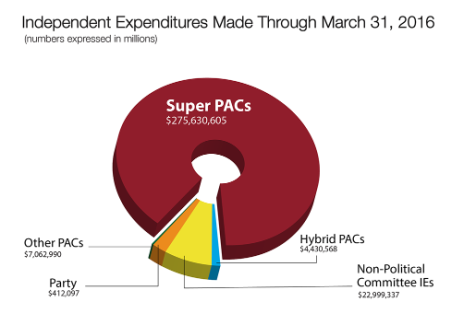 SuperPACs accounted for almost all reported independent expenditures during the 15 months examined. For additional information regarding the FEC’s financial report, including congressional candidate and political party committee expenditures, view the complete FEC release.